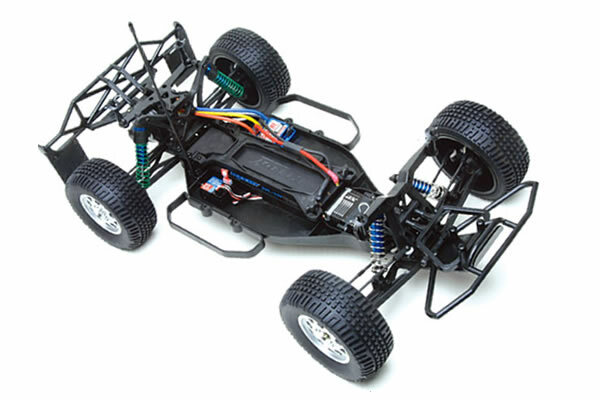 The 1/10th 2wd short course trucks are extremely popular. At first, Team Associated released the SC10 as a kit, but since few months, Team Associated now offers the SC10 as a Ready-To-Run vehicle. Basically, both trucks are the same, except that AE built the RTR for you and added their electronics. 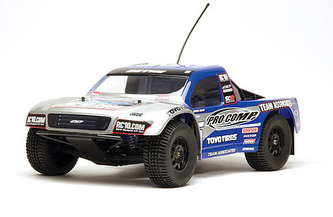 The SC10 is offered in different paint schemes (Lucas Oil, Pro Comp, Team Associated, KMC Wheels and Bully Dog) all from the Lucas Oil Race series. The SC10 is based on the 6-time National Champion RC10T4 electric stadium truck. In fact, at least, 90% of the parts are interchangeable. The SC10 comes with the well known XP2 AM radio system. This radio is included with many others vehicles from Team Associated since many years now. At first, the radio looks a little “plastic” but it offers features not found on others RTRs. Among those features, you’ll find steering endpoint adjustments, steering dual rate and throttle/steering trim. To power the SC10, a Reedy Radon 17T motor is installed. This motor is good for 30000 RPM and can be rebuilt when the brushes are worn out. The steering servo is not extremely fast but has metal gears and will resist to hard impacts. An SC200 ESC controls the power to the motor. This is a new ESC for Team Associated. It has a low-voltage cut off and is LiPo batteries are compatible. As soon as the 17T Reedy Radon motor comes to life, the SC10 quickly accelerates making long roaster tails. This motor pushes the SC10 with authority in the mid 20s MPH in just few seconds. The cut-off function of the ESC works perfectly. Before the battery pack went down, the motor stopped and only the steering was functional. This is an extremely nice feature to prevent expensive LiPo batteries from dumping. I mentioned earlier about the speed of the steering servo however the handling is not much affected. An 87T spur gear is attached to a dual pad slipper clutch to adjust wheel spin and also to protect the transmission. Team Associated uses a more compact transmission with a 2.6:1 final ratio. A bevelled-gear sealed differential is used and filled with grease which you can replace and tune your differentials. The diff is strong enough to resist to abuse of brushless motors. Steel dogbones are used to spin the rear wheels. All components of this smooth drive train spin on rubber sealed bearings. The SC10 comes with blue anodized aluminium shocks and shock spacers can be used to adjust the ride height. Those shocks are the same as the ones on the T4 and GT2 trucks. The complete suspension is very smooth. 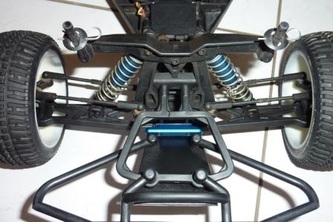 The front shocks use silver springs while the rear shocks use green springs. There are a lot of suspension possibilities to fine tune the toe, caster, roll centre and ride height. The shock towers and suspension arms offer plenty of shock mounting positions, to fine tune the suspension. As expected the SC10 handles great. The soft suspension allows enough body roll and makes the SC10 looks like a full scale short course truck when cornering. On the rough terrain, the suspension soaked bumps and holes with ease. I jumped the SC10 over different size of jumps. The SC10 took off level and landed on its four wheels jump after jump. The truck bottomed out when jumping bigger jumps when bashing. It is no big deal because others vehicles were also bottoming out. The SC10 uses the same steering components as the T4. A servo saver is used into one of the steering cranks to protect servo under impacts. Steel turn buckles are used to adjust toe and camber. Foam rings are used on all ball studs to keep dust and debris away. Like any others 2wd truck, the SC10 under steers when driving on surface with low traction and over steers when cornering and applying too much throttle. Few changes to the suspension and a better throttle control should correct this. The steering servo was strong enough to steer the wheel with ease.